Wednesday, November 14, 2018 at 8:00 p.m. 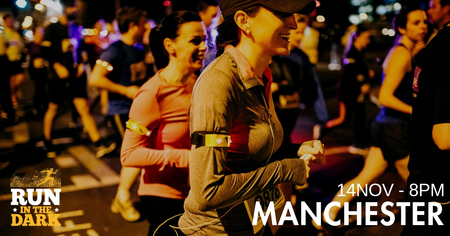 However, this year's event is not like previous Run in the Dark events in Manchester with road closures, chip timing etc. It's a casual pop-up run, and the route takes place predominantly on footpaths and pedestrianised areas that aren't closed to the public. The roads are open and other public transport will still be in operation. It is important to remember that traffic will not stop for you. At any stage where you may have to cross a road, you will need to stop. This event is about being part of the experience, not the time you complete it in. While we're sure some of you will keep track of your time on devices, for your own safety you must give way to traffic and other pedestrians. We'll have bikes leading the run and signs around the route to guide you. If there are any crossings, then marshals will be in position to remind you to stop. They will not stop traffic for you.